Yggdrasil Gaming created a pretty fun online casino game in the form of Empire Fortune. This 20-payline machine is designed to offer players the best chance at winning big. Playing online for free is fun enough, but the big deal with this machine is its progressive jackpot. There are three different jackpots, including the Medium and Mini jackpots that are locally-linked and smaller than the Ultra Progressive Jackpot. That particular jackpot is linked globally, meaning there could be millions of people contributing to it and attempting to win. 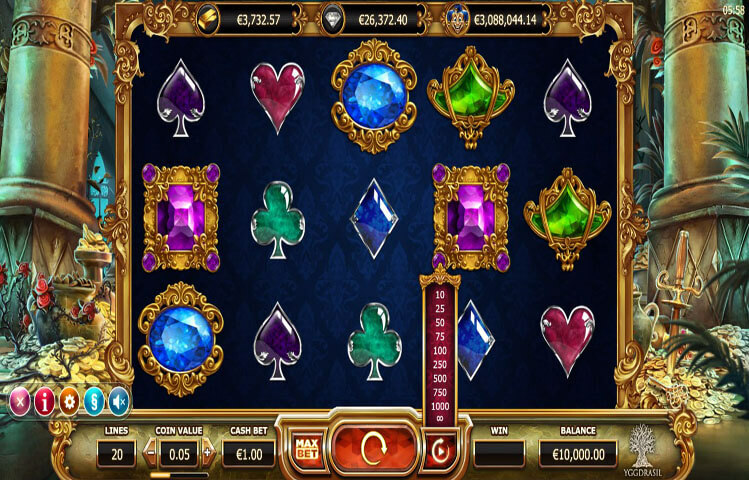 The payoff for this jackpot is the highest of the three jackpot types, making it an exciting and intriguing game to win. To join in the fun, players need to deposit real money and compete with their own cash. Otherwise, all that money will be paid off to somebody else. Each game in Empire Fortune features a 3×5 reel experience and includes a variety of bright and colorful images. The theme for this game is riches and fortune, particularly the idea of a family empire. Symbols take the form of various rubies and pieces of jewelry, including the highest-paying Ruby Heirloom. Matching this symbol and winning with it gives players a potential 2,500 coin payout (which translates to different currencies, based on the type used). Other icons included amethyst, sapphire, and emerald gemstones. Rare icons include the Faberge egg and the Yggdrasil mascot of the joker. These two icons help activate the bonus and jackpot rounds, which will be discussed in more depth below. Each icons is colorful and detailed, making them easy to tell apart. The background is also focused on the concept of “riches,” helping to draw players into the game and to set it apart from similar games on the market. These light touches make this a memorable game that is fun for multiple people of all ages. Activating the bonus round requires matching three to five Faberge Eggs symbols. This causes the Bonus Wheel to appear. It has three different layers that activate multiple prizes. These prizes vary depending on your level, but Mini, Major, and Ultra jackpot payoffs are possible. Matching three eggs lets you spin the bottom layer, four the middle layer, and five the top. Prizes range from 40-2,500 coins, 20-500 plus another spin, and a mystery price between 250-5,000 coins. There’s also the chance that you could activate free spins with the joker, which cost you nothing to spin and which typically pay out at a high level. Last, but not least, is the Fireworks bonus. This causes 3, 6, or 12 fireworks to activate and land on the prize wheel. This increases your potential payout in multiple ways.